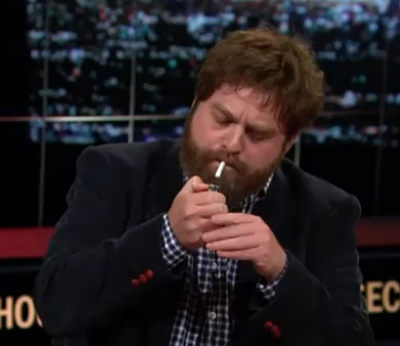 Actor Zach Galifianakis appeared on Real Time With Bill Maher last night to talk about the legalization of marijuana here in the U.S. He then offered the joint to another guest on the show, Margaret Hoover, who confirmed that it was, in fact, marijuana. No one else on the show wanted to take a hit from Zach’s doobie. Too funny. Good for him. It’s not that big of a deal. Who would you like to see smoking a joint on television?